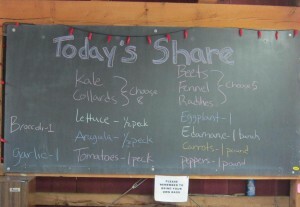 Greetings, and Welcome to Hampshire’s new CSA blog! I’m a longtime writer, gardener and (vegetarian) home cook, and I’m excited to share stories and recipes with you as the CSA moves week to week, from the bounty of late summer to the onset of winter. These next weeks are particularly exciting ones, if you’re excited by vegetables. 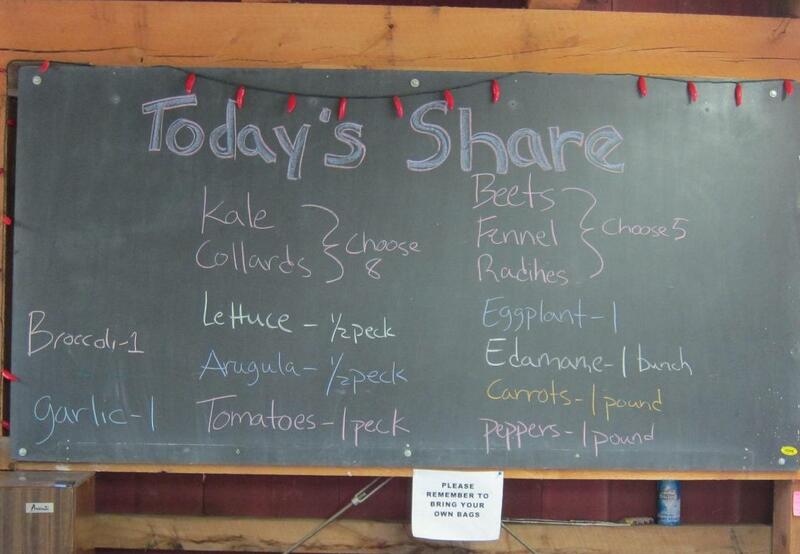 The summer’s harvest is coming to fruition, and the vegetables available are both gorgeous and plentiful. Especially gorgeous and plentiful both are the tomatoes. 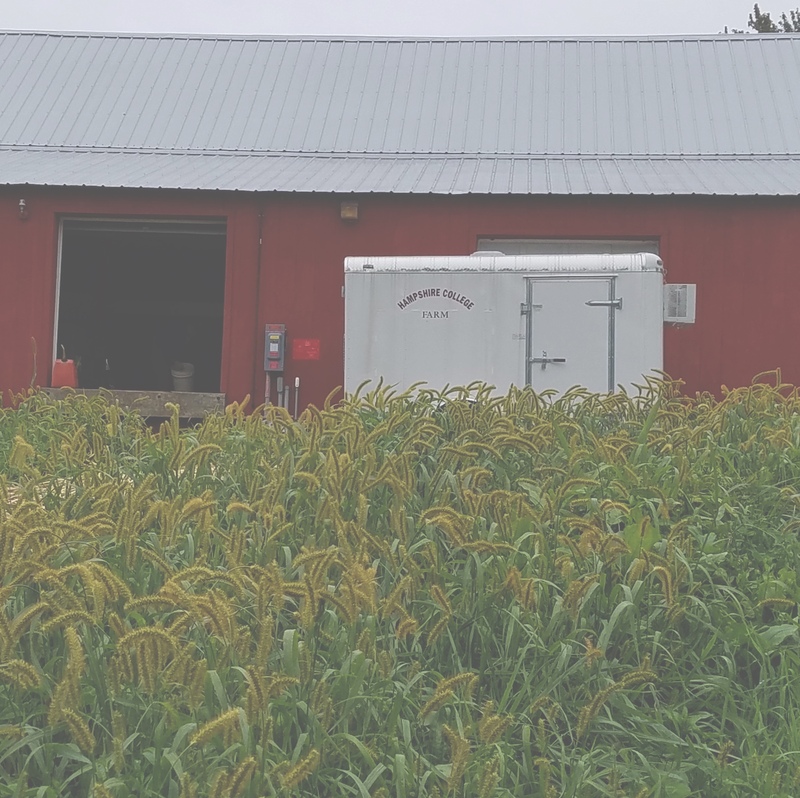 In the last week of August, Farmer Nancy Hanson and her crew harvested a literal ton of tomatoes. That’s not an exaggeration. 2000 pounds of tomatoes. 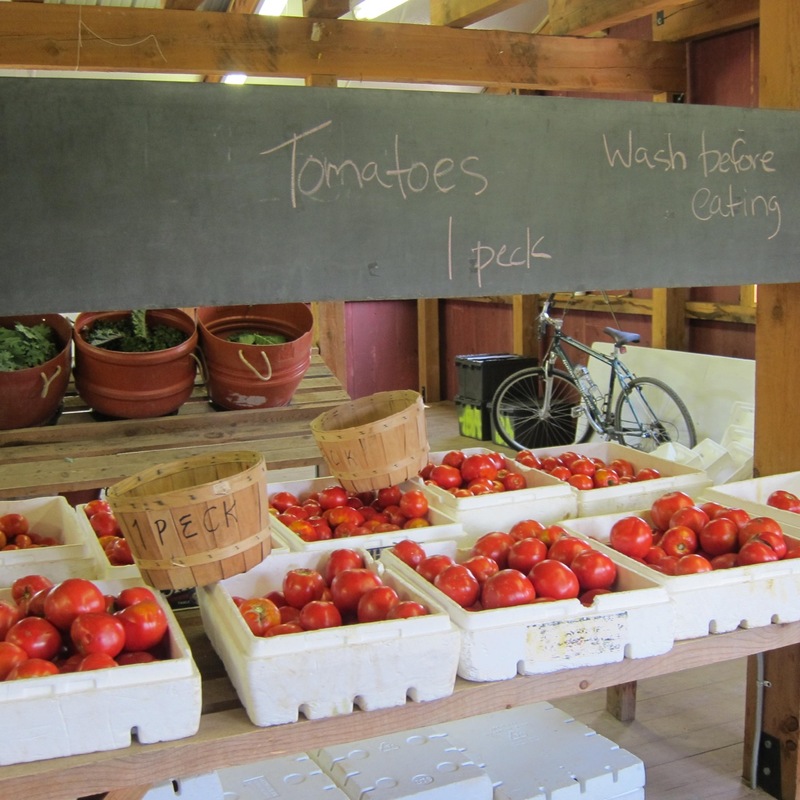 Even with the Dining Commons buying a tidy 400 pounds, that’s still a lot of tomatoes for CSA shareholders. The latebreaking news on this front is that just yesterday, Nancy and many helpful volunteers harvested nearly 2 more tons of tomatoes. (3945 pounds, to be precise.) That’s more than the farm harvested all year last year. Amazing. In addition to the stalwart hybrids seen on the tomato table below, the Hampshire Farm grows a number of heirloom tomatoes, many with fabulous names. If you ever wanted to try a Hawaiian Pineapple tomato or a Trucker’s Favorite, now is your chance. So, this blog will start with tomatoes and continue with them for a little while. Tomato season is not one to rush through. One obvious thing to do when faced with a bounty of tomatoes is to make sauce. If you have space in your freezer, this is an even better thing to do. 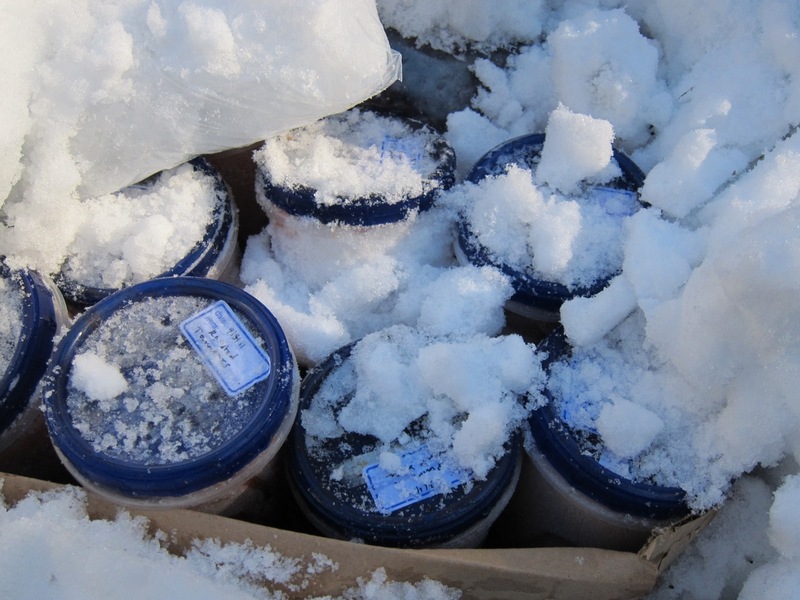 Tomato sauce freezes beautifully, and it is a wonderful thing to have on hand in, say, January when there is no possibility of a lovely, local tomato, at least not if you live in Western Massachusetts. I am so attached to the sauce in my freezer that when I lost power for 5 days in the October 2011 snowstorm, I became fixated on saving my tomato sauce, even if I lost the rest of the contents of the freezer. I ended up covering the containers with bags of ice and then burying them in snow. I can’t tell you how happy I was at the end of that 5 days, not just to have my power back but because the sauce survived. I ate it gratefully all winter. Every year, I always make some plain sauce, the long-simmered kind with onion and garlic and basil. 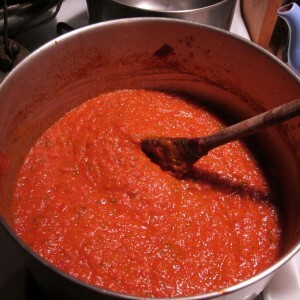 But I also always make a large quantity of roasted tomato sauce as well. It’s a wonderful sauce to make if your tomatoes aren’t perfect and even more delicious if they are. 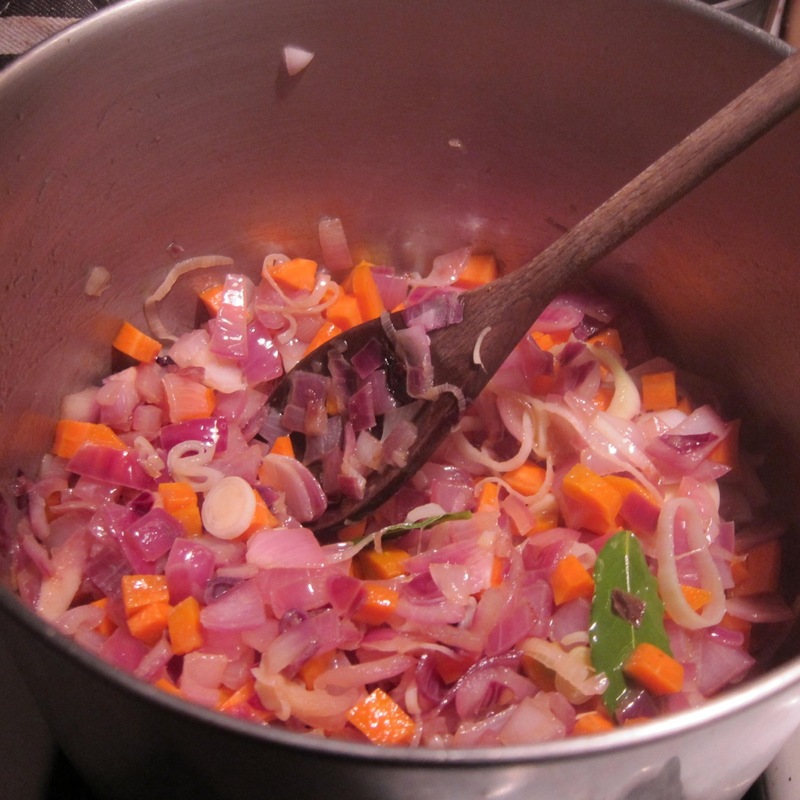 This is a sauce that contains other vegetables in it, not just onions and garlic but also leeks and carrots and a lot of basil, which give the sauce additional depth. It also doesn’t take quite as much time to cook as the long-simmering kind. Another thing to know is that you can make it in two parts. If you have time to roast the tomatoes but not to make the sauce, that’s fine. The roasted tomatoes can sit in the fridge for up to a week, and you can just make the sauce when you’re ready. This recipe is from Alice Waters’ gorgeous cookbook, Chez Panisse Vegetables. I’ve made just a few small changes to the recipe. In all the years I’ve been making this sauce, I’ve never figured out what Alice Waters intended you to do with the garlic–she says to split a whole garlic bulb in half but doesn’t say what to do with it. I’ve chosen to mince several cloves and add it to the other vegetables. Another alternative would be to roast it with the tomatoes. I tend to roast the tomatoes longer than the recipe suggests, though this is a judgment call and also depends on whether you’re ready to proceed with the sauce or not. Tomatoes that are more roasted are not a problem, as long as they’re not burnt. The recipe also says to put the sauce through a food mill at the end. I love my food mill in general and use it often to make soup or applesauce, but it’s not my first choice for this recipe. I find that putting it through the food mill makes for a very thin sauce, and I prefer mine thicker, so I just puree the whole thing with an immersion blender at the end. (It may be tomato sacrilege, but for the most part, I don’t worry about peeling and seeding the tomatoes. I’ve never found tiny bits of tomato skin to be a detriment to the sauce being delicious.) If you don’t have a food mill or immersion blender, never fear. 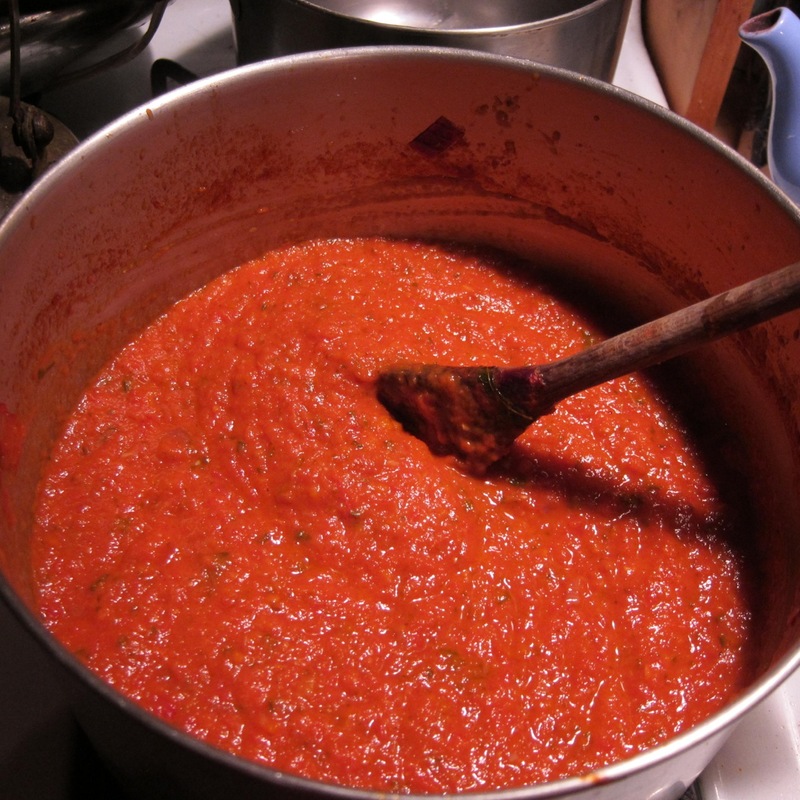 If you want a smoother sauce, you can put it in a regular blender, in batches. If you have no blending equipment at all, you can eat the sauce in its natural unblended state. Whether you make this sauce to eat now or eat later, whether you use just a few of your precious tomatoes or a lot of them, I encourage you to make this sauce. This is a September sauce, if there ever was one, and now is the time. Cut out a cone at the stem end of the tomatoes to remove the core, and cut the tomatoes into quarters and then into smaller pieces if desired. If using plum tomatoes, quarters are fine. Toss with half the olive oil. Put the tomatoes in a baking dish and roast them, uncovered, for 30-60 minutes, stirring a couple of times to encourage even cooking. The tomatoes are cooked when the flesh is very soft and the skin separates easily from the flesh. At this point, you can refrigerate the roasted tomatoes for up to a week before making the sauce. Otherwise, begin making the rest of the sauce while the tomatoes are roasting. Peel and slice the onion. Trim, wash and dice the leek. Peel and dice the carrot. Mince the garlic. Heat the remaining olive oil in a stainless steel or other nonreactive (not aluminum) pan. 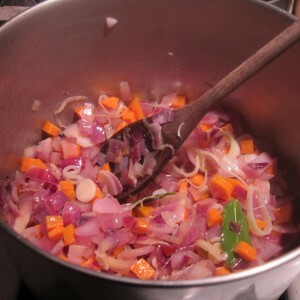 Add the vegetables and the garlic and cook over medium heat until completely soft–about 10 minutes. Add the roasted tomatoes and the herbs. Simmer, stirring frequently to prevent scorching, until the flavors come together, for 30-45 minutes. Pass through food mill (if you want very thin sauce) or puree in blender ( my preference) and season with salt and pepper. 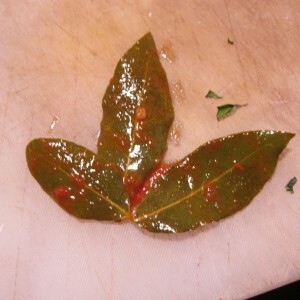 Don’t forget to take the bay leaves out before you puree it! 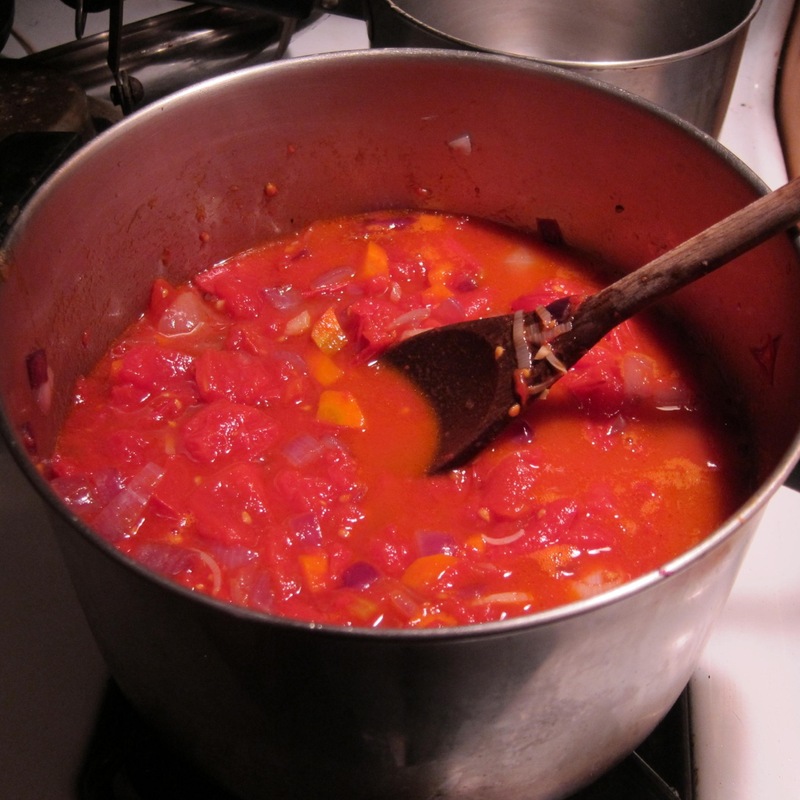 I have another great tomato sauce recipe (well, it’s a sort of guideline, not a full exact recipe). Blanch and peel tomatoes. Cut tomatoes into medium-sized chunks. Chop onions, slice mushrooms, crush garlic. Sautée butter, onions, and mushrooms. Add garlic. Sautée until cooked and lightly browned. Add tomatoes to sautéed ingredients. 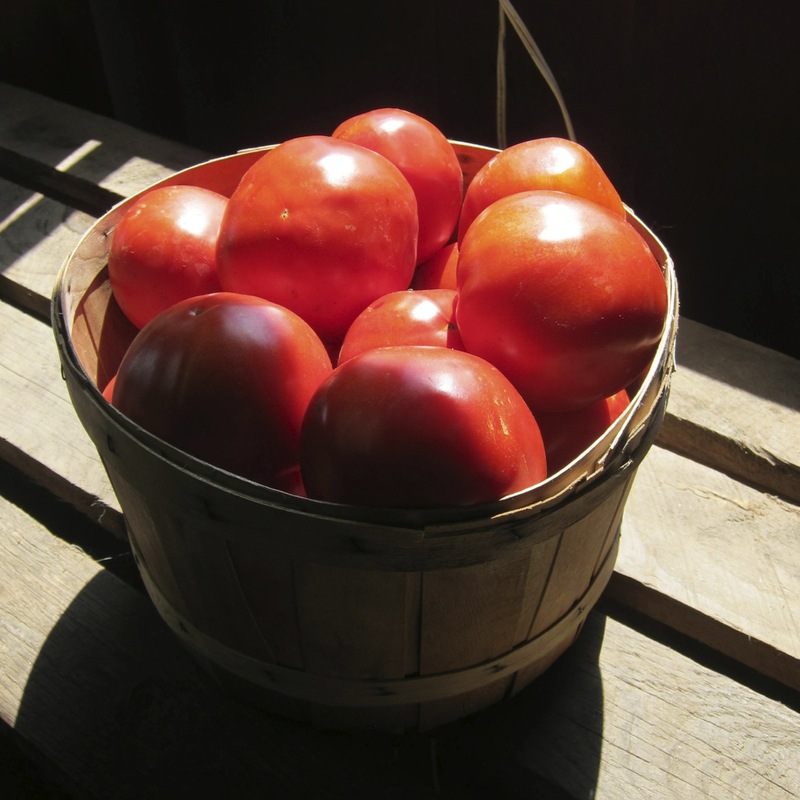 When tomatoes soften, mash them. Add spices. Let sauce boil down until desired consistency is reached.